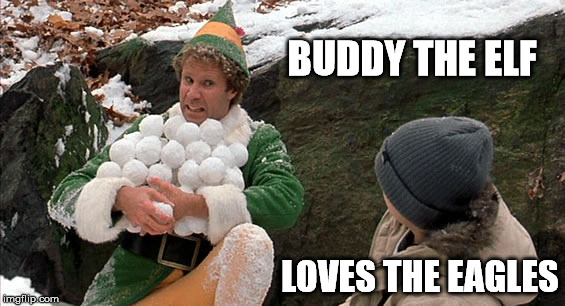 Week 13 Late Games and Monday: Buddy the Elf Loves the Eagles! Experimenting this week with quick picks after the good games. This is the best of the late games, and a real test for Philly. The fans are already at the Super Bowl, planning their snowball lines of attack. The local Targets are sold out of batteries. The parade route in Philly is being planned. We’re here to play our second Settle Down! Card on the Eagles. We think it’s more likely that the Eagles wind up 13-3 than 15-1, and they still get to play the Giants, Raiders, and Cowboys. This week vs Russell Wilson and 52 other guys, and next week against the Rams are their big tests. The most interesting stat I came across “researching” this game. Carson Wentz has passed for more yards than the opposing QB in every game this year! We don't know if this has ever happened before, so we’re just going to say that it’s unprecedented. The Chargers have been favored by more than 10 at home 7 times in their history. Of course, they are 0-7 ATS in these games. We told you on Thursday not to try and catch a falling knife with the Cowboys, and that worked out not OK. But there’s no such thing as a home game for the Chargers anymore, so it’s OK.
We’re excited to see Josh Gordon back on the field and wish him nothing but the best. Unfortunately for Josh, he still plays for the Browns. It’s Groundhog Day for this guy. Imagine waking up 3 years later and nothing is different. There's a strange resemblance to our dad in this pic. You decide which character makes us do a double-take. We know we’re being trolled by this line, which should be 10. Good teams have been covering huge lines against bad ones, except the ones you can't trust, like Pittsburgh. We also know that the Chargers, despite putting some points on the board the last two weeks, are still the Chargers, so we know the beatdown is coming. We think they’re planning something special for the new fanbase, like 4th quarter Week 17 collapse to miss the playoffs. But for now, it’s still February 1. Why do teams “look ahead” and get trapped with losses to bad teams? You couldn't blame the Rams for getting really excited to play the Eagles, but they shouldn’t, not just yet. Robert woods is out. Jared Goff is still a second year QB and the back half of year 2 is where a QB can fall into a funk. (see Prescott, Dak and Wentz, Carson). The Rams were the surprise team of weeks 1-4, and have kept it up. They’re likely to wind up with 11 wins and the division. But that means 3-3 the rest of the way, and this one shouldn’t be overlooked. The Cardinals are playing for their lives this game, and it will matter. Another really good game in the Thunderdome that is the NFC South. Unpopular take here, but I think the NFC Super Bowl team comes out of this division. Maybe not the Saints, maybe not the Panthers, and maybe not the Falcons, but someone. So many reasons why not to take both teams in this game, so we just say take the points and fade the very public Saints. The Steelers have a 3 game lead in the division with 5 to play. They could all but wrap it up with a convincing win here against a Cincinnati team that’s destined to finish 8-8. But you know it’s going to be way closer than it needs to be, because Steelers. Pick: Bengals +5.5. If Antonio Brown can't go, then we like Cincy +195. There’s nothing to like about this game. Except from now on the name G-men stands for Geno.